Diabetes mellitus is a chronic disease for which its occurrence and risk vary. Diabetes mellitus is an ancient disease which may have been present on the globe for thousands of years. It is distinguished from diabetes insipidus, an uncommon medical condition in humans in which there is an enormous excretion of urine which stems from dysfunction of the hormone vasopressin. Early researchers observed that some people had sweet urine and that they were hungry, thirsty, and urinated a great deal. Inadequacy of the human pancreas accounts for these symptoms and signs, and the term “mellitus” is a reference to something which is “honey sweet .” The pancreas in these cases does not produce sufficient amounts of insulin, or the human body is unable to effectively use it . Worldwide, there are approximately 347 million people who have this disease. More than four-fifths of those with it reside in low- and middle-income countries . In 2012, there were 29 million adults in the United States with diabetes mellitus [2, 3]. Of those who have the disease, many are not aware of its presence. This is especially true of people who have prediabetes, in which the blood sugar is higher than normal but the elevation is not sufficient to make a diagnosis of diabetes mellitus [2, 3]. The risk of this disease increases for several reasons. First, it rises with age, and elderly people, therefore, comprise a significant proportion of those with it. Second, racial/ethnic minorities are at risk for type 2 diabetes mellitus, but their risk for type 1 diabetes mellitus tends to be lower than that of Caucasians . There are also genetic predispositions for this well-known condition . In women it is a more serious illness than in men for several reasons. They are more likely than men who have it to develop blindness, and the survival rates from a heart attack in women tend to be lower than they are in men who are diabetic . When a woman who has never experienced elevation of the blood sugar has that during pregnancy, she has gestational diabetes mellitus. This situation requires careful medical management to keep the sugar in good control because the baby may subsequently suffer from respiratory problems. Moreover, the offspring may be too large, or macrosomic, at birth [2, 3]. The babies of mothers who have gestational diabetes are at especial risk for overweight and obesity during the childhood and adolescent years. They may also develop type 2 diabetes. In fact, the occurrence of this illness in children and adolescents in the United States has increased over the last two decades and is currently one of the most common chronic diseases in children there . Finally, gestational diabetes occurs more commonly in African-Americans, Hispanic/Latino Americans, and American Indians than other racial/ethnic groups . Diabetes mellitus is a serious medical condition, and everyone must know about its risk and predisposition. Ahmed, A. (2002). History of diabetes mellitus. Saudi Medical Journal, 23, 373-378. Centers for Disease Control. (2015). Diabetes. Retrieved June 28, 2015. University at Albany. State University of New York. School of Public Health. (2015). Prediabetes: How healthcare providers can take action. Retrieved June 28, 2015. World Health Organization. (2015). Diabetes programme. Retrieved June 29, 2015. 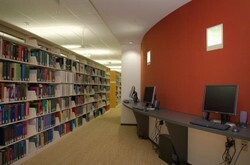 The photo is of a library at the United States Centers for Disease Control. The information contained in this article is for educational purposes only and should not be used for diagnosis or to guide treatment without the opinion of a health professional. Any reader who is concerned about his or her health should contact their physician for advice. Good information here. The increase in diabetes in children is, in my humble opinion, due to the consumption of processed food. Thanks for the article.